Juicing — mechanically extracting the juice from fresh vegetables and fruits — has received a lot of publicity lately. Juice bars are popping up all over Manhattan. Everyone is buying either over-the-counter juices or expensive juicing machines to use at home. But if you book an appointment with a gastroenterologist, they will tell you the question that needs to be asked is whether juicing is truly better for you than eating fresh fruits and vegetables. The answer is not as cut and dry as you might imagine. Fruits and vegetables have always been part of the U.S. Department of Agriculture’s guidelines for healthy eating. If you don’t like eating them — or if you feel you don’t get enough — then juicing is an accepted way to get the vitamins, nutrients, and minerals you would otherwise miss. Juicing helps your body absorb those nutrients and antioxidants because liquids are easier to digest than solid food. So getting your plant-based vitamins in liquid form gives your digestive system a rest from the complex food you eat most of the time. Furthermore, some food combinations require different digestive enzymes, which can stress your system. Juicing eliminates this problem, as the juice ingredients are all from the same food family. Fresh fruits and vegetables contain lots of healthy fiber, which is one of the benefits of eating them. Juicing removes most if not all of the fiber, and your body needs fiber to stay regular. While lots of fiber does stress your digestive system, our bodies have evolved over the millennia to be able to handle it. Not enough fiber causes a host of other problems, including constipation, unexplained weight gain, and some say perhaps even an increased risk of colon cancer. When you remove the fiber from your fruit and vegetables, you’re left with the vitamins and nutrients, as well as large amounts of natural sugar and calories. These aren’t the empty calories from soda, but they are calories nonetheless — and more calories than you probably realize. A juicing diet can lead to weight gain and an increased risk of diabetes. While some research has been completed on the juicing phenomenon, little scientific evidence has emerged that juicing provides an advantage. One study, in fact, proved just the opposite. Published in the American Journal of Epidemiology, the study showed that juice drinkers (two or more servings a week) were 29 percent more likely to develop diabetes, not far from the 42 percent of soda drinkers. While juicing in moderation shouldn’t hurt you, it isn’t a healthier option than eating fresh fruits and vegetables. If you juice your produce, keep some of the pulp; it’s good fiber and will help you feel full. Make your juice fresh. Unprotected, juiced vegetables and fruit can attract bacteria. Beware of bottled juices, which tend to be pasteurized and sweetened. Read the labels. Finally, don’t go all in. Juicing is best when you use it to supplement, not replace, your existing diet. 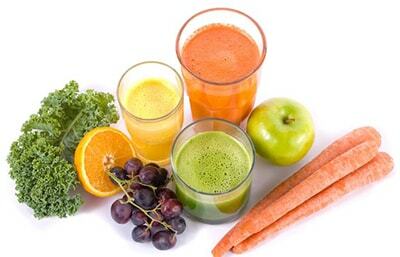 You can get all the benefits of juicing while eating a regular, balanced diet. Dr. Shawn Khodadadian is a New York City Gastroenterologist that provide more information on juicing and it’s effects on the digestive system. Book an appointment today.